Just before you get the wrong idea - it's not us that are pulling up our roots and deciding to move home. 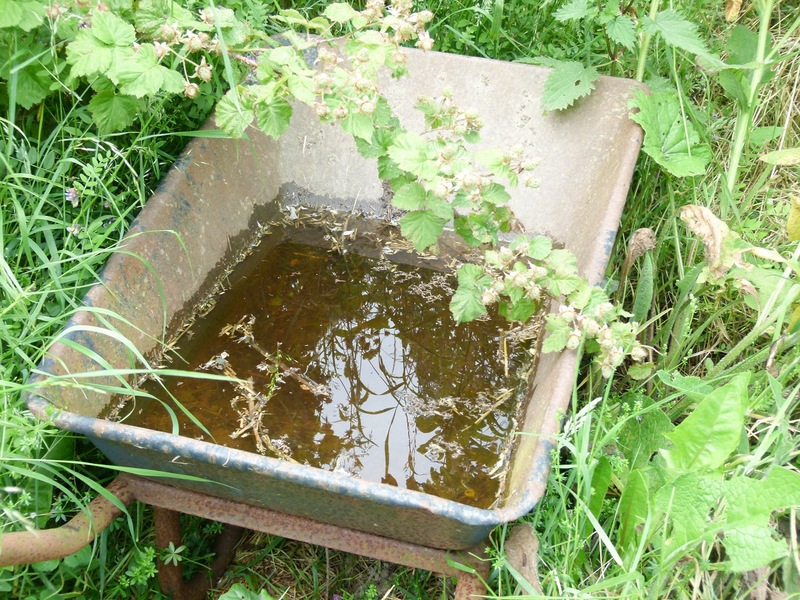 Often plants just appear at the allotment. We don't remember planting them they just appear. Maybe seeds or in this case even the odd bulbs find their way from the garden to the plot. 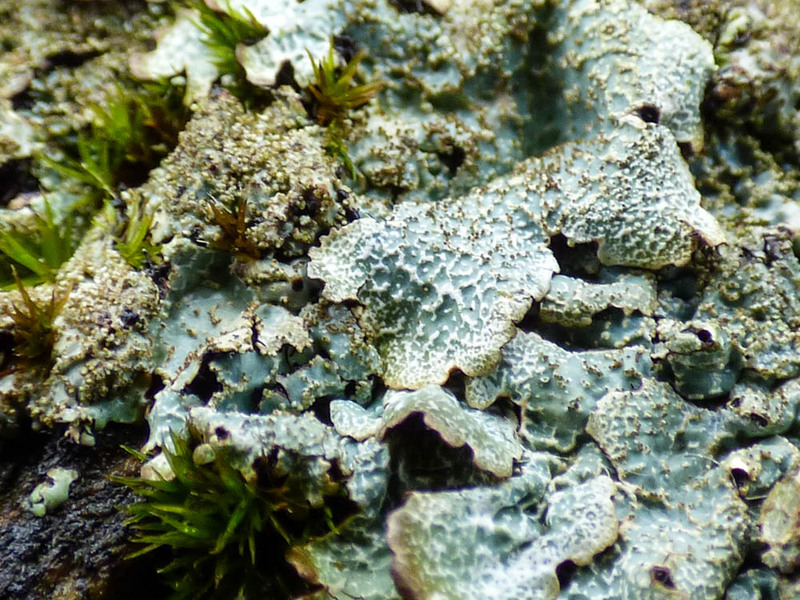 They secretly grow and in due course we notice them. 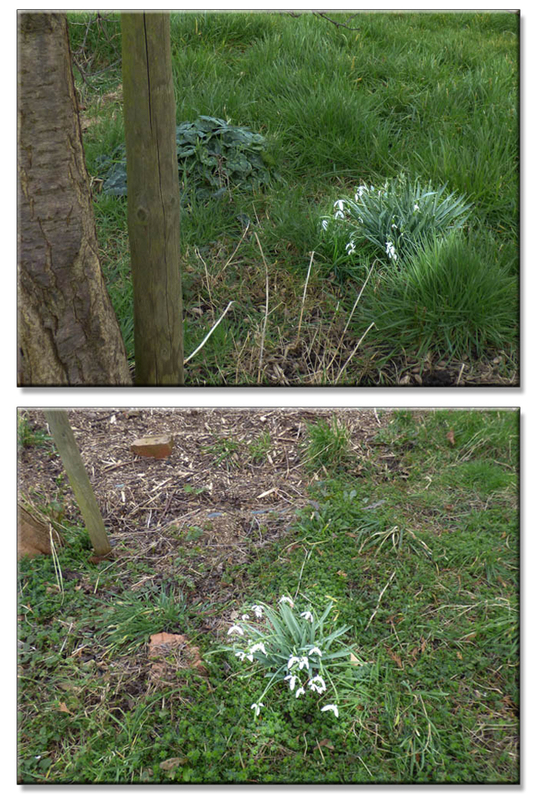 A few days ago we noticed some clumps of snowdrops growing in the long grass under our plum and greengage trees. I've highlighted them to make then easier to see. In the above photos they're at the point of going over but a few days earlier they looked like this. 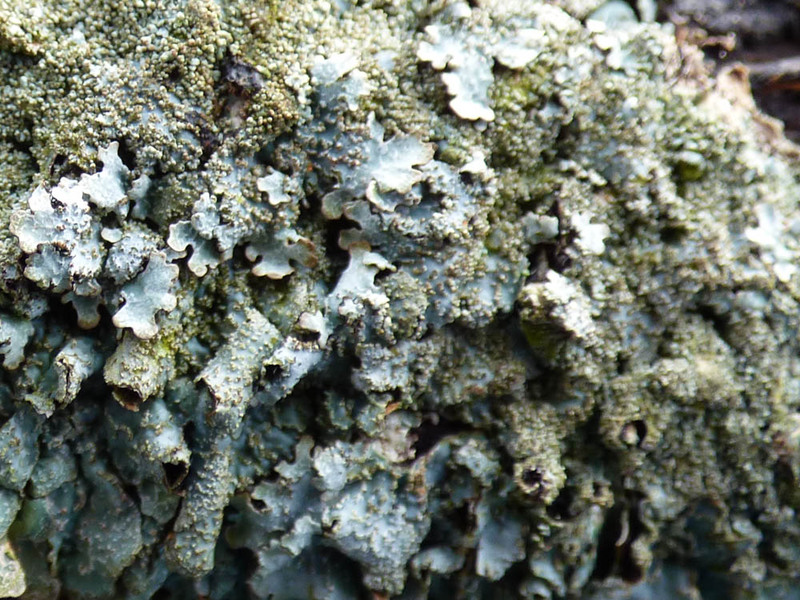 It seemed a shame that they were at their best at a time when our plot visits were short and infrequent. As I have posted we wanted some snowdrops for the front garden but when we visited the garden centre very few were on offer. 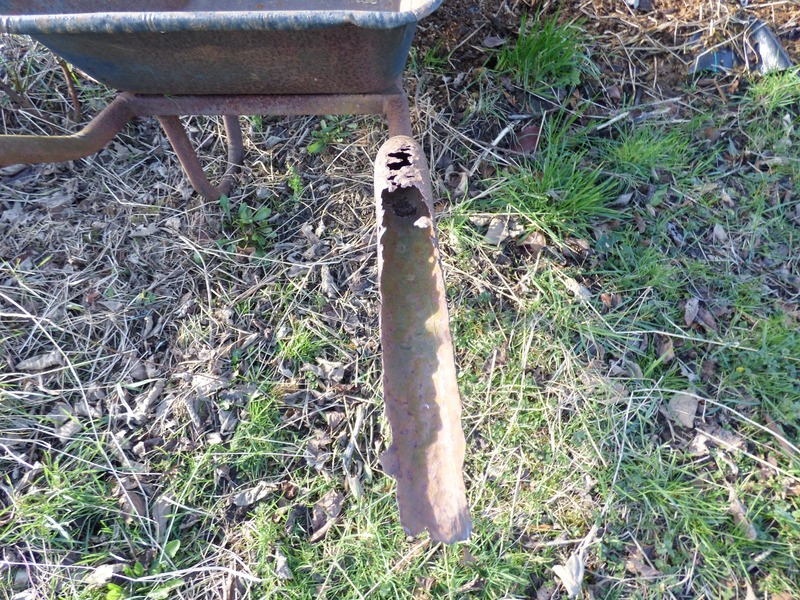 We both separately had come to the conclusion that it would be a good idea to transfer the clumps from the plot to the garden and that it was now a good time to do this. ... and a short time later the clumps were split, cleared of grass and weeds and rehomed. 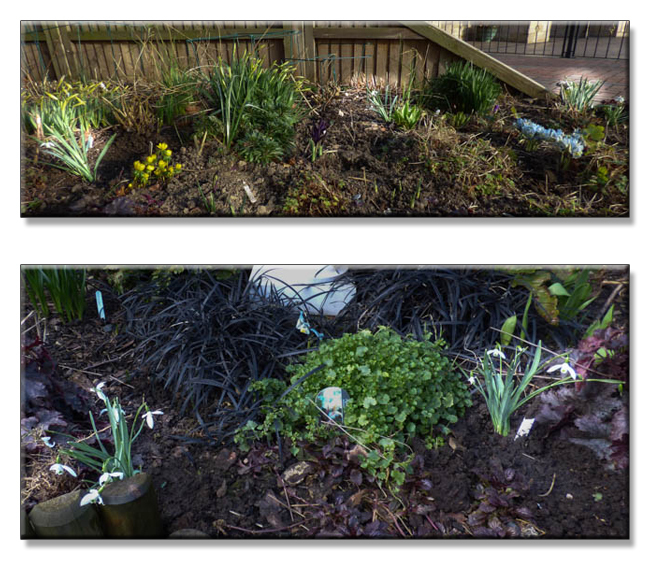 Some went in the front garden bed as planned and the rest went into the blue and white border in the back garden. 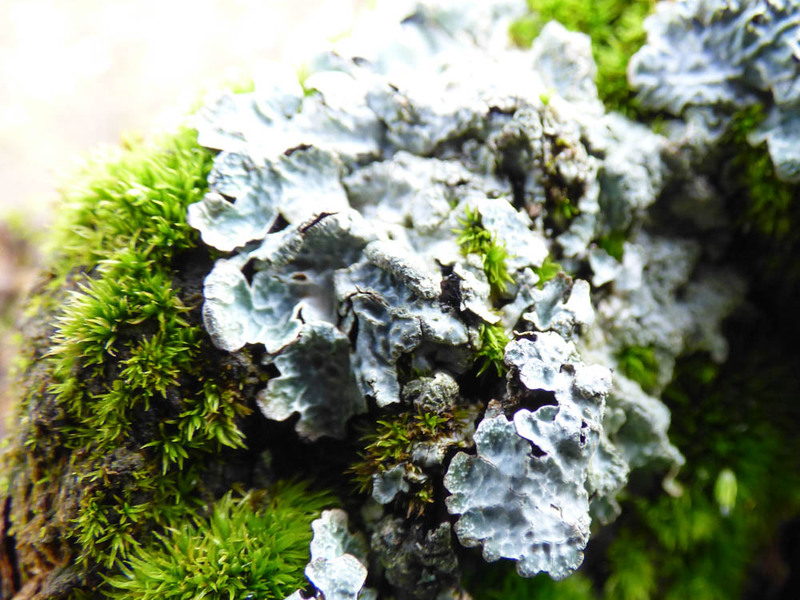 Again I have highlighted the clumps. 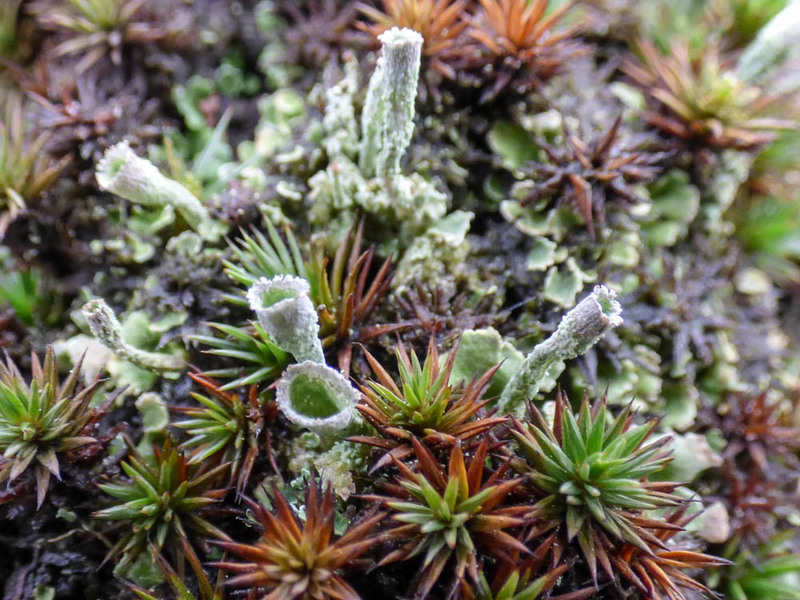 The clumps will increase and should add some early splashes of spring for the next few years. 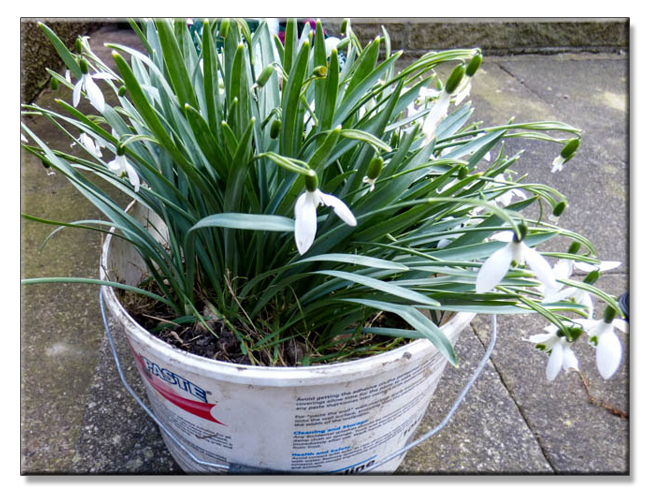 Can anyone have too many snowdrops? This year I am going back through last year's photos to compare how things were looking in the garden and on the plot last year with the same dates this year. The middle photos was taken on the 22 February 2014 and the other two on 25 February 2014. 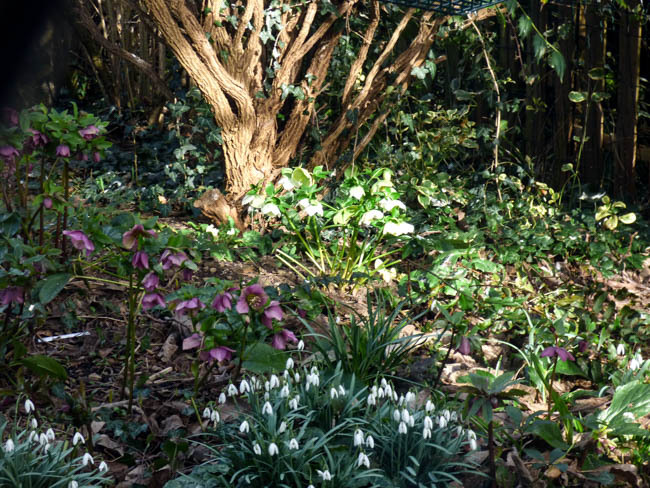 The hellebores and snowdrops under the magnolia are at about the same stage as they were last year. 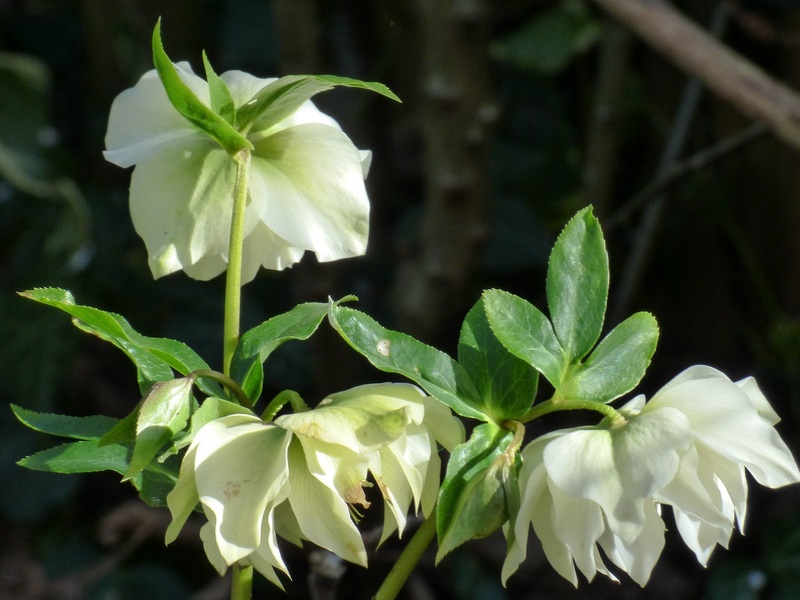 Paying closer attention this year I think I now know why some clumps of hellebore always seem to flower earlier than others. 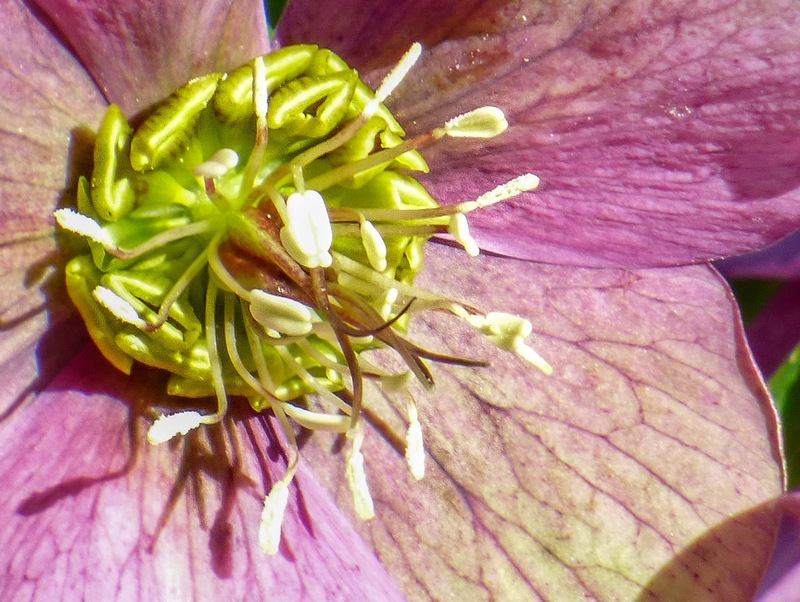 The earlier flowers sit in patches of sunlight earlier. 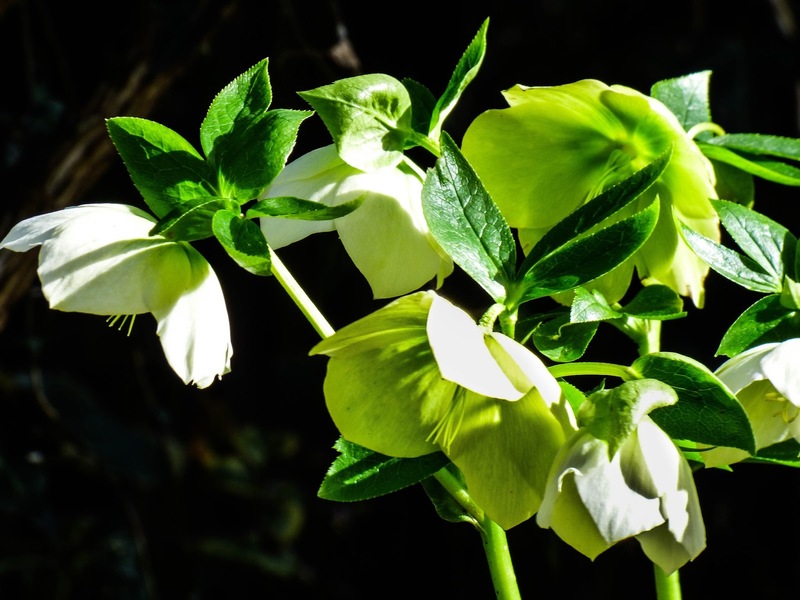 When the sun is lower less light filters through and these lucky plants that are bathed in early sunlight respond by flowering earlier. 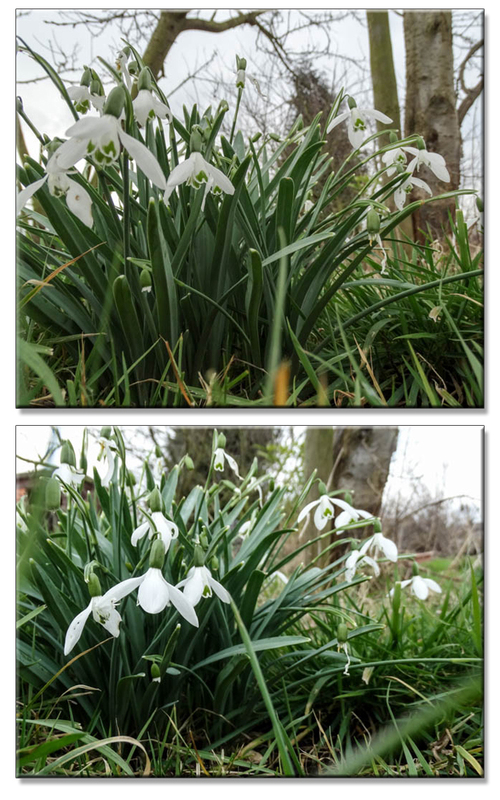 The photo is the middle above was taken on 22 February, the top photo on 24 February and the bottom one on 25 February. The crocuses are at about the same stage but as it was a sunny morning the flowers are open. The daffodils are behind - more so around the bird bath. 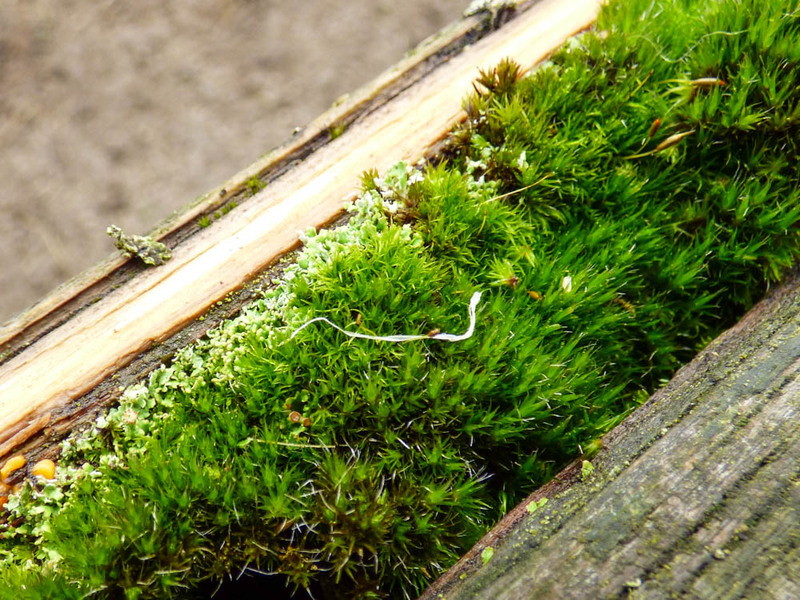 I am behind too as I haven't yet tidied up the dead fern fronds. The daffodils in the last photo are in the front garden so have the benefit of any sunshine throughout the day should it actually choose to shine. It would appear that the daffodil bulbs have suffered more from the dull February weather than have the crocuses, hellebores and snowdrops. 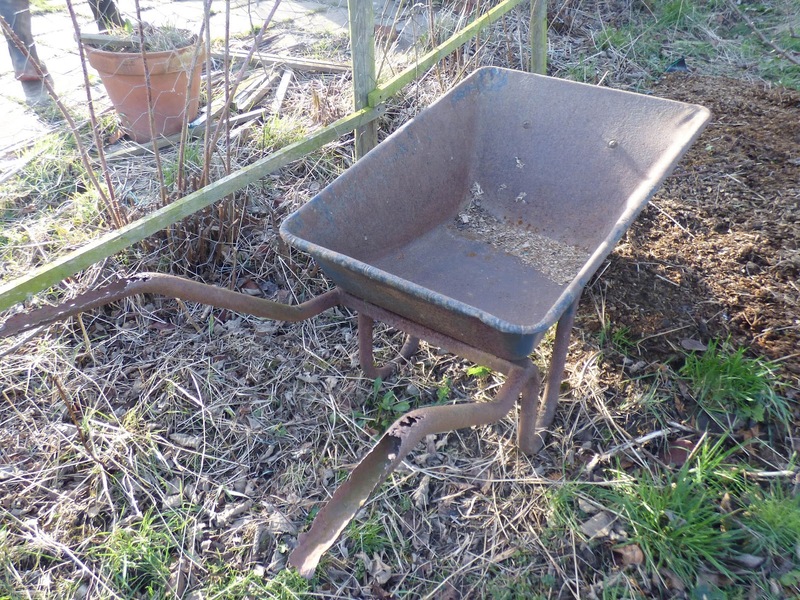 Imminent retirement, due to poor general condition, of the present post holder means we have a vacancy for a new plot wheelbarrow. The successful applicant will be based on our allotment plot. Must be able to withstand being out in all weathers. 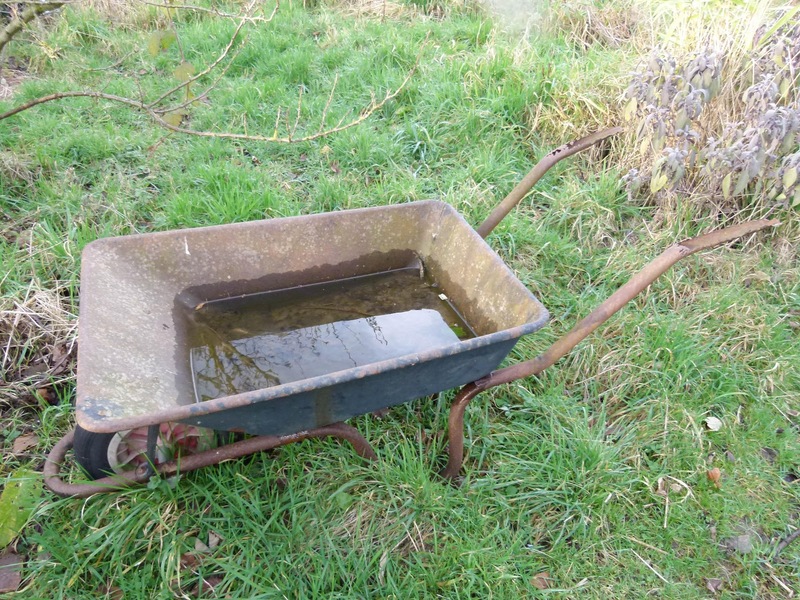 Must be of a robust nature and able to work on uneven terrain. 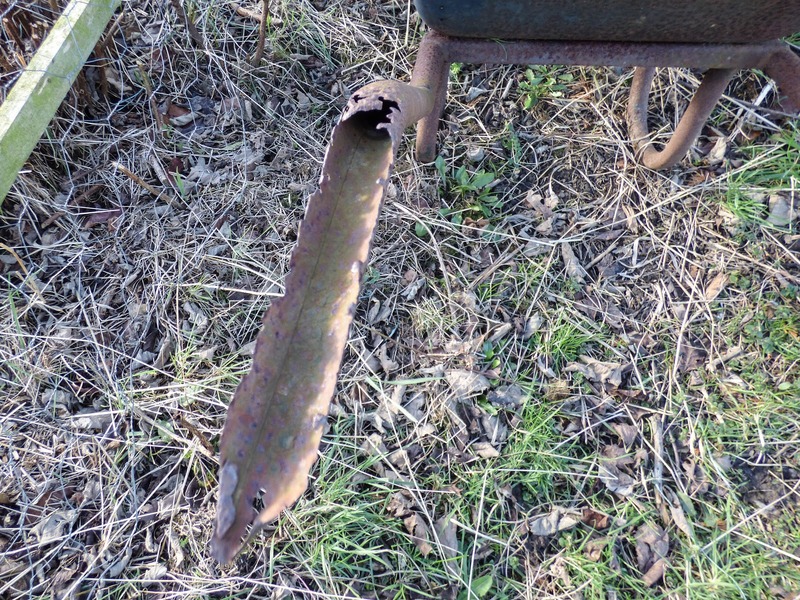 Must be lightweight but sturdy. Must be agile and manoeuvrable and able to work in tight spaces. Must be able to withstand long periods of inactivity but still be able to perform reliably at a moment's notice. It would be helpful if the successful applicant was unattractive to those who would try to poach their services and remove them to a new position. No experience is required as training will be given and so this position would suit a newbie. Recommendations for this post would be most welcome. 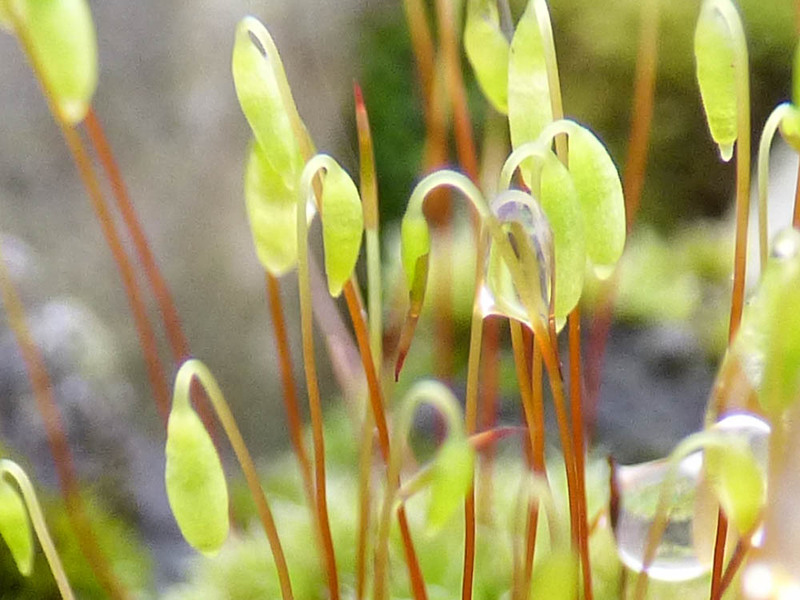 If you read Martyn's blog post you will have heard about our aborted visit to a garden centre and how as a result I was not a happy bunny. Martyn had taken me off to photograph a couple of steam trains - one in the morning and another in the afternoon. He had also planned that we would have lunch at a large garden centre between locations and my plan was to browse for a while before we headed off for the afternoon's photography. The afternoon train decided to run early and so my plan was thwarted but, as the garden centre is only about half an hour from home, I was on a promise to return. It was also an excuse for another lunch out. Just in case you are interested both lunches were excellent. 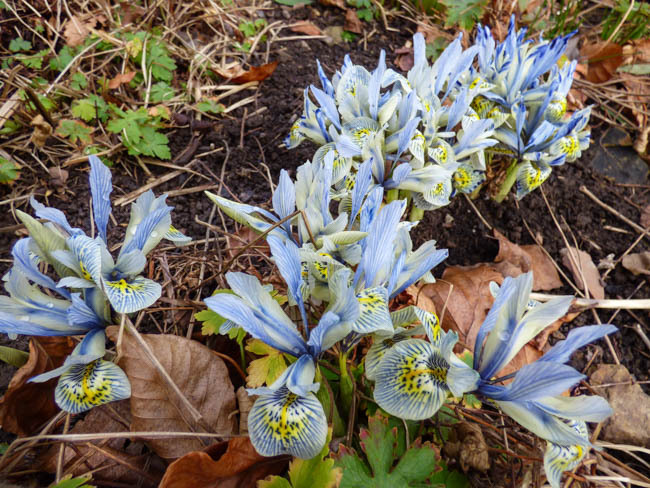 My focus was spring bulbs to add more colour to the front garden bed - in particular some more dwarf irises to add to the Katherine Hodgkins that are looking lovely at the moment. The garden centre hadn't missed a trick as to reach the restaurant on our last visit we had to pass the spring displays. As well as irises I had my eye on some aconites. In the end we returned home with a boot full of pots and a stomach full of beef and mushroom pie. I could have maybe squeezed a few more plants into the boot but certainly couldn't squeeze anything more into my stomach although Martyn topped up with a slice of mud pie. 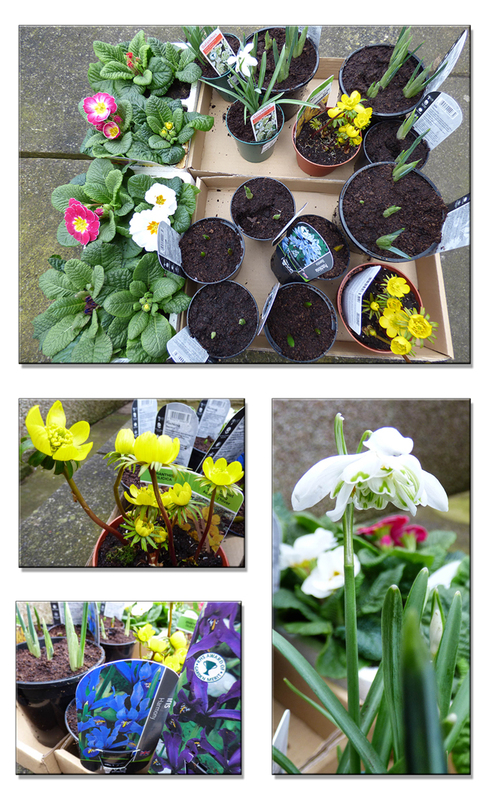 We bought pots of aconites, two type of irises - George and Harmony (the only varieties on sale), double snowdrops, puschkinia and some pots of primroses. I know it's an expensive way to buy bulbs but hopefully they will bulk up. 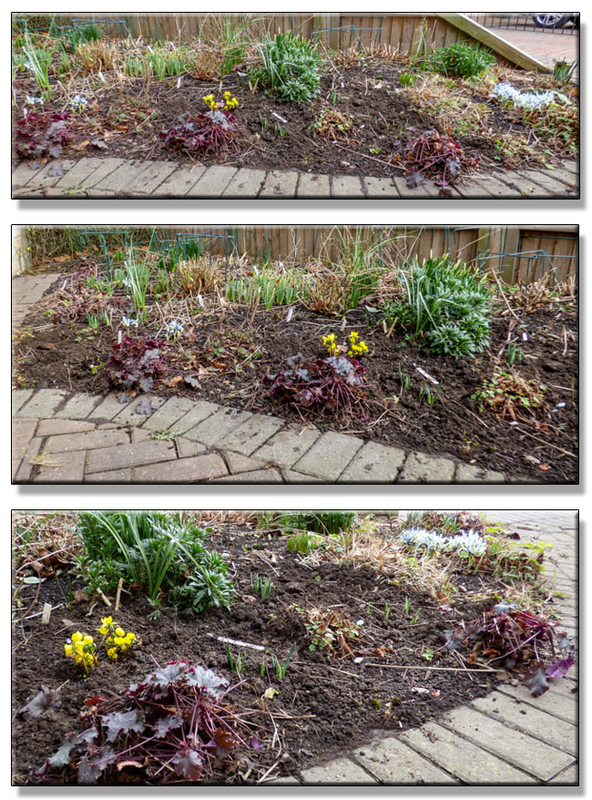 The primroses are destined for a tub but the bulbs have been planted in the front garden. At the moment there isn't much to show for it but hopefully the front garden will soon have lots of colour. 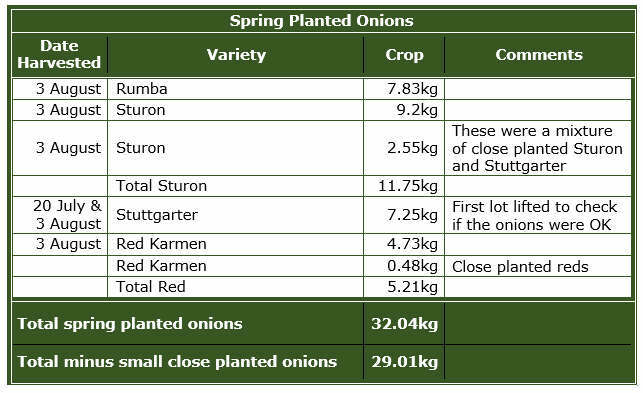 As for the onions the cropping comparison may be unfair as we have no record of how many sets we planted. We grew Red Sun and Golden Gourmet last year. 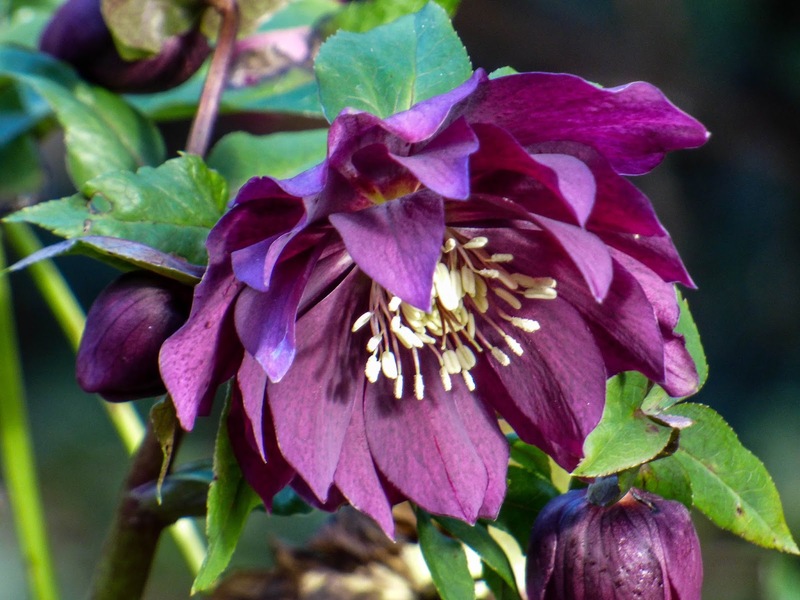 They generally seem to do well and they are the two varieties that we will grow this year. As for the onions the bulbs finished their growing and were harvested about a month early but unlike the onions this didn't seem to affect the size of the bulbs produced although there may have been fewer bulbs in the clusters. 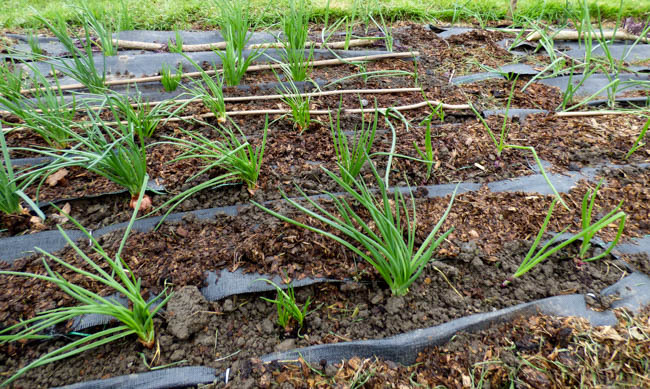 As for the onions the shallot are started in modules and then transplanted, as with the onions it is important that the root system doesn't become pot bound as this can produce a check in growth from which they don't fully recover. We tried growing the banana type varieties in the past but they weren't really successful. Has anyone had good results from these and if so which varieties did you grow? 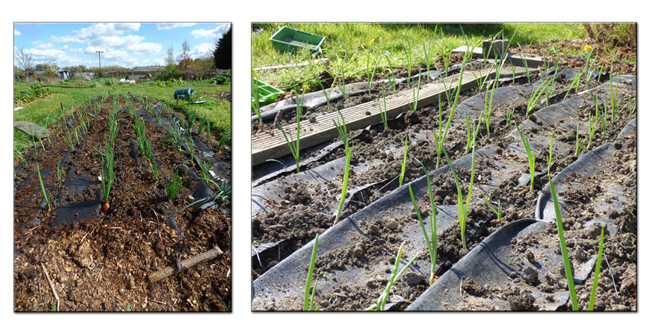 Last year was the first time in a while that our autumn planted onions did really well. I know that we had a mild winter but I think the main reason for the improved performance was that we planted the sets much earlier. In 2013 we planted directly into the ground on 21 September which was about a month earlier than in previous years. Previously we have ordered autumn onion sets online as this has offered more choice but it also means that planting time is at the mercy of the timing of the delivery of orders and in the past this has been rather late. Last year we decided to buy sets locally even if this meant that we had less choice. This strategy appears to have paid off as last year we had a good early onion crop which lasted well. 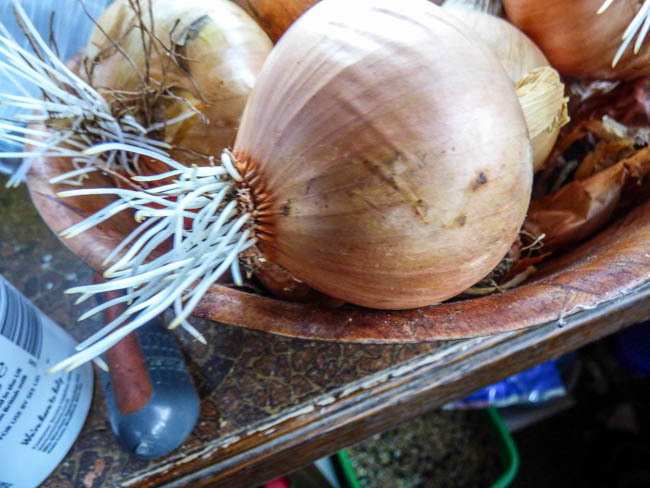 We start picking the autumn onions as soon as we think they are big enough to use but last year we ended up lifting and storing some in the greenhouse for later use. I think one advantage of getting them in the ground earlier is that they have time to put on some growth both above and beneath ground before winter sets in and calls a halt. The table below shouldn't really be used to compare varieties as I think we planted more of some that others. Next year we will try and keep a better record of what we plant. In 2014 we repeated the early planting on 25 September and planted, First Early, Electric Red and Troy which were the varieties available locally. They were off to a good start and are holding their own in spite of the constant battering that the wind has subjected them to. 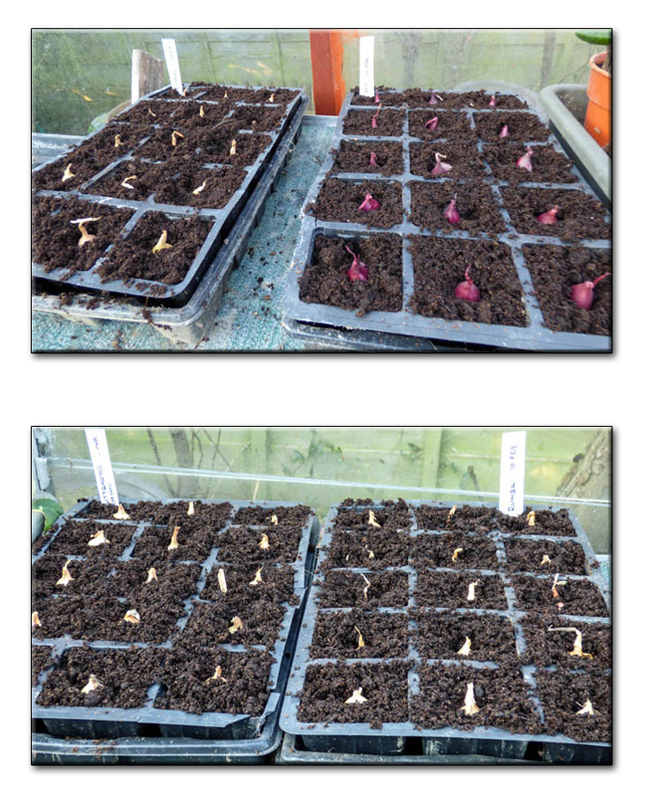 To try for an early start for the spring planted onions, the sets (or at least some) are started off in modules and planted out as soon as conditions allow. Last year things started off well. Then at the end of July things suddenly went wrong. The plants just suddenly keeled over leaving us worrying about allium leaf miner or onion and leek moth. Received opinion was that this was neither so it remains a mystery. 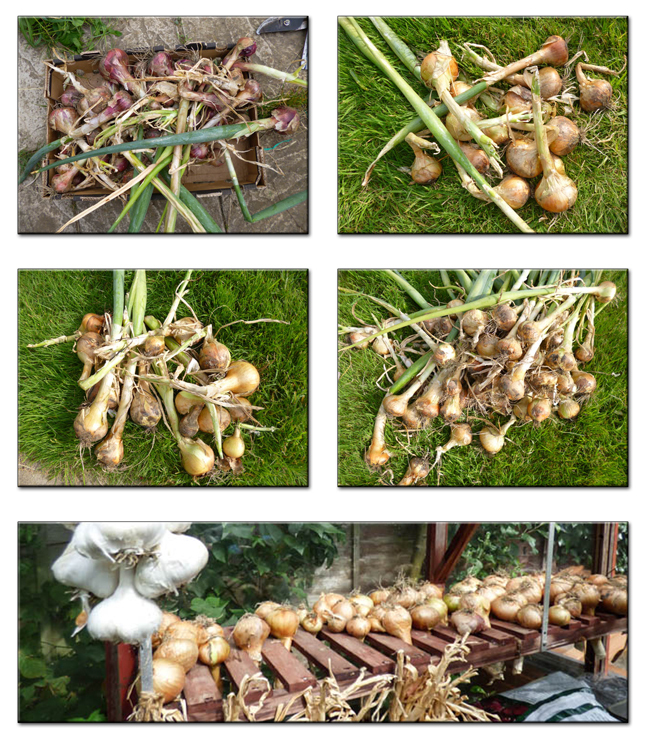 We harvested some and the bulbs seemed fine and so the whole lot was lifted on 3 August as there was obviously no more growing likely. The previous year we lifted the onions on 8 September, a whole month later. 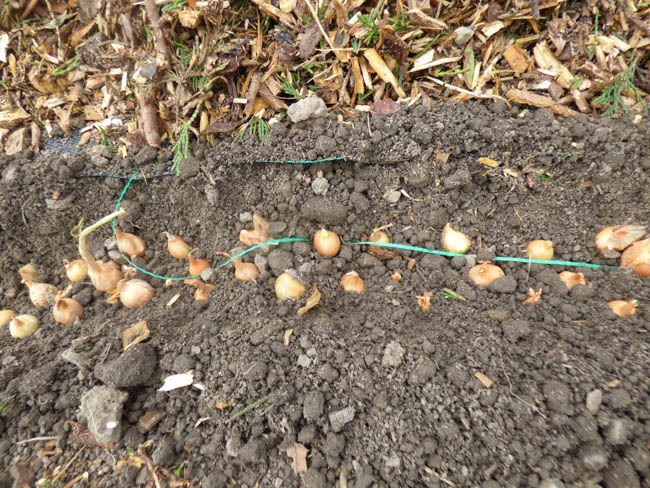 The mature onions were rather small - some being not much bigger than the bulbs produced by the closely planted sets . There are always too many sets in a bag so this is how we use them up. 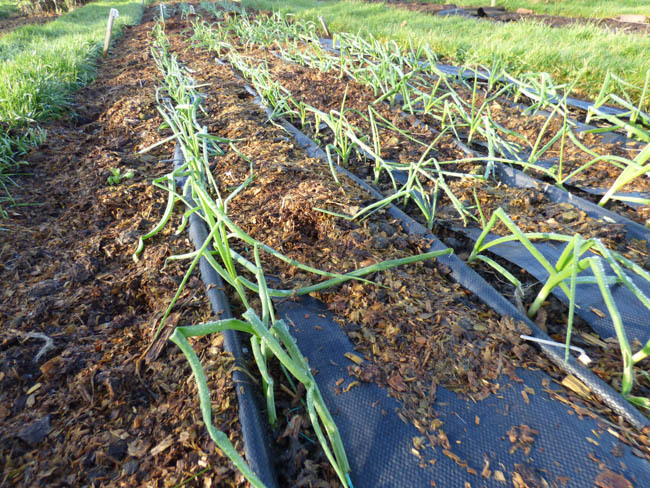 They produce good pickling onions from this planting method. After drying the onions were stored on cardboard trays firstly in the shed and then the garage. In previous years we have stored them in the greenhouse but we felt the conditions were too damp which made the onions more likely to rot. The drier atmosphere seems to have been beneficial. This year we will be growing Red Karmen, Rumba, Sturon and Stuttgarter again. There does seem to be rather a lot! I doubt they will all be planted. 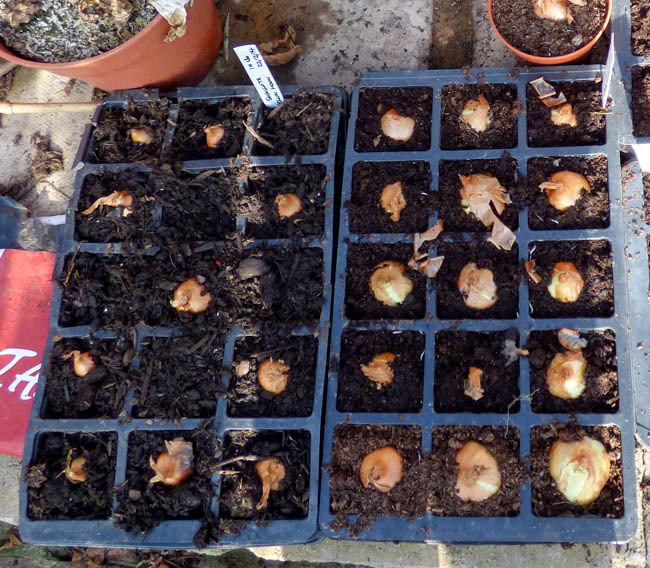 Batches of each variety of onion have already been potted into modules so here's hoping the mystery problem that affected our onions last year was a one off occurrence. 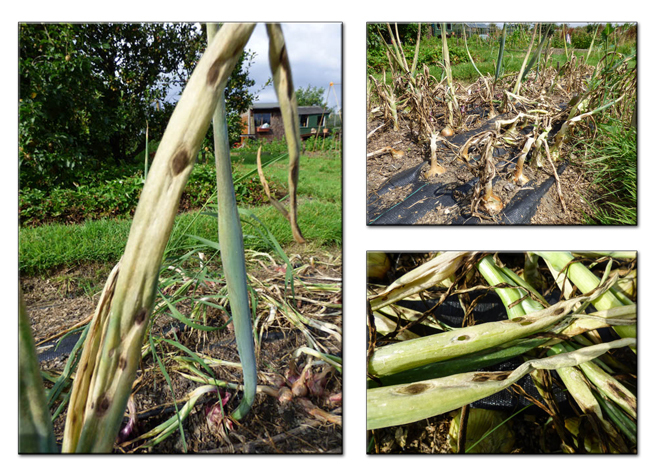 We are still using the spring planted onions but I think their time may be running out. It's mainly the very small ones that are still to be used up so I look set for an onion peeling session. Anyone ever frozen small onions for use in stews etc. I know that they are readily available to buy all year round, I'm just thinking about not wasting the ones we have grown. Maybe I should make some French onion soup and freeze that.